Two units, one in NSE livery, while the other in Jaffa Cake livery. A train in modified NSE livery with rounded corners. Network SouthEast (NSE) was one of three passenger sectors of British Rail created in 1982. 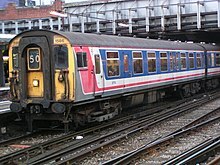 NSE principally operated commuter trains in the London area and inter-urban services in densely populated South East England. Before 1986, the sector was known as London & South Eastern. This page was last changed on 10 August 2018, at 00:20.